One of the reasons there aren’t so many new postings on this blog is the international MediaCity 2010 Conference that will take place at the Bauhaus-Universität Weimar this autumn. I am the main organizer of this event, where over 60 scientists, activists and artists will meet and discuss about the city and media. 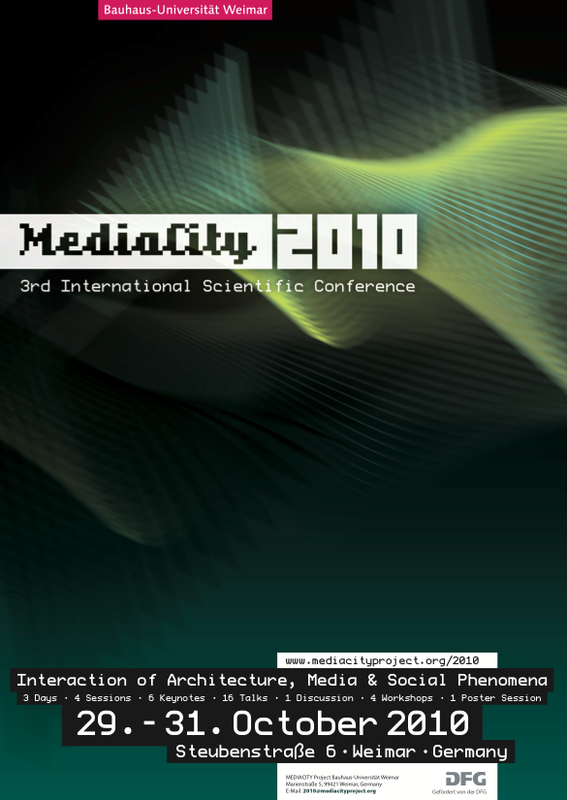 The main topic of the conference is “Interaction of Architecture, Media and Social Phenoma”. The international scientific conference will take place the 29th to 31st October 2010. Es ist etwas ruhiger auf diesem Blog geworden. Einer der Gründe ist die große MediaCity 2010 Konferenz an der Bauhaus Universität Weimar. Ich habe die Ehre, diese internationale wissenschaftliche Konferenz zum Thema “Medien und Stadt” in Weimar hauptverantwortlich zu organisieren. Die Konferenz läuft unter dem Thema “Interaction of Architecture, Media and Social Phenomena” und findet vom 29. bis 31. Oktober 2010 statt. Es werden über 60 Wissenschaftler, Forscher und Künstler sprechen. be sure to check out the nice wallpapers as well! Die MediaCity-Konferenz geht bereits ins dritte Jahr und hat sich durch die erfolgreichen letzten beiden Tagungen zu einem international anerkannten wissenschaftlichen Ereignis zu den Themen “Medienarchitektur, Urbaner Kontext und Soziale Praktiken” entwickelt. Die diesjährige Konferenz wird von der DFG unterstützt und untersucht, wie Medien zu einer neuen Definition von sozialen Handlungsweisen und urbanen Räumen herausfordern und wie sie Architektur sowie Medienkunst & -design im urbanen Kontext beeinflussen und neue soziale und kulturelle Praktiken etablieren. Kernthemen der Konferenz sind Öffentlichkeit, Mobilität und Kommunikation in ubiquitären Netzwerken sowie die Interaktion mit digitalen Inhalten. The 3rd MediaCity conference will investigate how new media re-define social settings and urban spaces and how they influence architecture as well as media art & design in urban contexts, thus constituting new social and cultural practices. Today, media create opportunities for diverse forms of connections between people and spaces, enabling and forming flows of information. New digital places for information and communication emerge, and the context of existing spaces is transformed by the joint impact of media and architecture, thus leading to new forms of social and cultural practices. The public sphere, the communication in ubiquitous networks, and the interaction with digital content will be a thematic focus. The conference addresses different approaches and methods of research in four sessions and three workshops, exploring these themes in a focused way. Posted on 25. September 2010 by audiocommander. This entry was posted in Articles in English, Arts/Kunst and tagged Architecture, Body, Interactive, Medienkunst, Mobile Phone, Politik, Public Art, Raum, Raumtaktik, Stadt, Urban Research Institute, Weimar. Bookmark the permalink.